Oh M…er..Erin you’re so fine, you’re so fine you blow my mind hey M…er Erin, Hey Erin. I have to admit this song was kind of going through my mind as I typed out the name of this doll. Guess that shows my age, yes, I was and still am to some degree a teenager of the 80’s. This lovely Erin is no child of the 80’s. She if a full on fashion diva of the present. Her dress is TO DIE FOR folks..worth the doll alone in my opinion but I digress. This is the last Erin produced with this original face mold. She has been given a facelift and we will see her new visage IRL when the first W Club doll ships sometime this summer. Many people are not fans of the “open mouth show us those pearly whites” face mold. I don’t have a problem with it. It kind of makes her look sweet and innocent. Her fashion is anything but. I have to admit, I was trepidatious about photographing this lady in THIS gown sitting down but I went there. 1. Armature wire isn’t going to work because most of her leg shows with this gown but hey..if you want to spend countless hours Photoshopping the wire out..have at it. 3. Thought I was smart using strings to suspend her…WRONG!! I failed to realize the folds in the fabric and the impact they would have on Photoshopping out the strings. BAD ME! Yep…had to spend the thankless hour and a half Photoshopping out the strings then cloning back in the folds on the background for the roughly 20 full standing shots of this set…AAAACCCCKKKK. Note to Rebecca: When using complicated backdrop DO NOT USE STRINGS!! 4. The above mentioned reasons should explain why I then had to sit this lady down. Yes, I realize that she is getting dangerously close to performing a Sharon Stone Basic Instinct but it was either that or learn to embrace Photoshop as a way of life. Okay, enough of me whining about my inability to think ahead LOL…on to the photos. And…just because this was a rocker wedding and I don’t think Erin would have attended alone. This entry was posted on May 29, 2012 by raberry65. 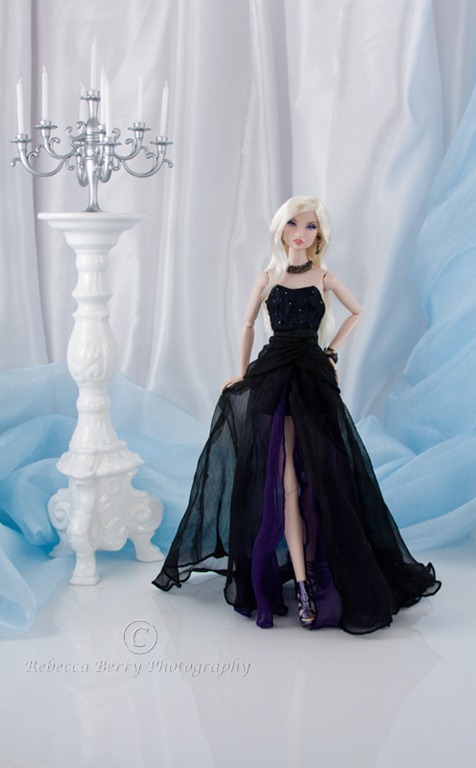 It was filed under Erin, Fashion Royalty and was tagged with Doll Diorama, Doll Photography, Fashion Royalty, Inside the fashion doll studio, Integrity Toys, Nu.Face, Rock Wedding dolls, You Look So Fine Erin. Soooo gorgeous! If we ever have a play date, I can imagine we’ll spend half the time spent in front of the computer PSing. LOL. Rebecca. What can I say other than I am always happy here and you are the “QUEEN OF BACKDROP LUST”. I am always at “ahhhh”, with your pix. They literally relax me when anxiety is at its peak. Keep up the good work and most of all, keep ’em coming. Awwwww! Thank you so much. Photography is my destresser so I am glad the photos help you with that too. Love Erin – and her date!!!!!!!!!!!!!!!!!!!!!!!! Isn’t he a cutie?! He is not really dressed for a wedding but I figured it was a rock wedding so everything goes right?